Women are more likely than men to take career breaks or work part-time to care for young children or elderly parents. Photo credit: ADB. Singapore ranks 9th in the world in terms of the female labor force participation rate. An estimated 60% of the female population aged 15 years and older are working. The median income for women in Singapore is estimated to be 91% of men’s median income, compared with the world average of 63%. However, while Singapore has come a long way toward gender equality, there remains a substantial and underestimated gender gap in retirement savings. Last year, a report on the Gender Retirement Savings Gap of Low-Income Professionals from Marsh & McLennan Insights, the International Longevity Centre Singapore, and the Tsao Foundation found that among the low-income population, women retire with 17% less savings on average compared with men. This is driven by the cumulative effect of wage inequality over time, as well as shorter working lives: Compared to men, women are more likely to take career breaks or engage in part-time employment to fulfill domestic responsibilities, such as caregiving for young children or elderly parents. Source: Marsh & McLennan Insights, the International Longevity Centre Singapore, and the Tsao Foundation. Inadequacies in retirement savings are especially worrying for Singapore, as rising life expectancies and declining birth rates are resulting in rapid population aging: The elderly (aged 65 years and above) are expected to grow from 11% to 20% of the total population over the next 15 years. Given women’s longer life expectancies, the general trend of rising medical expenditures, higher rates of health care use as people age and the weakening of family-based support for retirement income, women face serious challenges in maintaining a reasonable standard of living after retirement. Moreover, as the population ages, women’s traditional role as caregivers is likely to lead to them shouldering an even greater burden of care. Women retiring early to care for elderly parents or aging spouses is already a familiar story. In Singapore, women earning SG$2,500 ($1,800) and above per month comprise 70% of women working full time and 44% of the overall workforce for middle- and higher-income levels. Our fresh analysis explores the caregiver penalty for a child and elder care in terms of the retirement savings gap for female professionals. We modeled the total retirement savings of three archetypes of women. The findings show that compared to “Career Women” with uninterrupted work lives, the “Traditional Working Mom”—who takes a career break lasting approximately 5 years in total in the earlier stages of her career to care for her children—has 53% lower savings at retirement. This is followed by the “Good Daughter”—who retires approximately 7 years early to care for elderly parents and/or an aging spouse—with a relative gap in retirement savings of about 30%. What drives this significant difference? 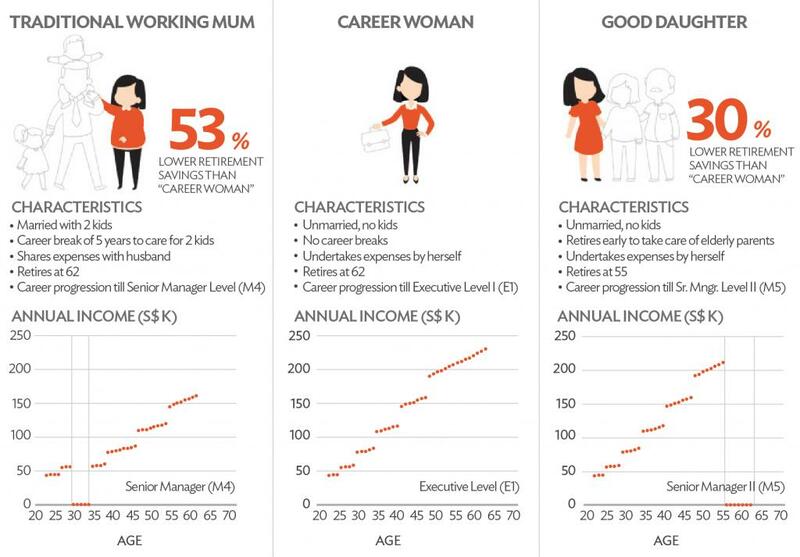 Firstly, career lengths matter: When the Traditional Working Mom and the Good Daughter take career breaks, this also results in breaks to their contributions to the national mandatory savings plan—the Central Provident Fund account in Singapore—which earns a better rate of return than the average interest rate of local bank savings accounts. The Career Woman contributes for more years and is able to build a larger retirement fund than the other two archetypes. Secondly, career breaks delay and limit career progression. Breaks taken at the earlier stages of her career result in the Traditional Working Mom missing development and promotion opportunities while out of the workforce. In comparison, the Career Woman sees regular and quicker progression and eventually reaches a higher job and linked salary level than the other two archetypes: The difference in average final salary amounts to 31% less for the Traditional Working Mom. Third, it is challenging to resume work after career breaks. The Traditional Working Mom and Good Daughter may find it tough to go back to their old roles or find new jobs in their old fields as their skills become less relevant with each passing year, given the fast pace of change in jobs today. Women’s future wages could fall by as much as 4% for each year out of the workforce. This may be one reason why some women never return to the workforce after spending several years as full-time caregivers. The caregiver penalty in retirement savings is a long-term consequence of unequal sharing of care responsibilities and unpaid work among couples. Inadequate retirement savings present long-term costs for individual women and their families, as well as businesses and society overall. Hence, it is vital for all stakeholders involved to play their part in addressing this challenge. Employers should play an active role in creating flexible work conditions that make it possible for women to balance professional and family commitments. In addition to improving female employees’ financial security, this will help companies attract and retain talent as well as prevent productivity loss, especially in the context of an increasingly aging and shrinking workforce. The Singapore government has initiated policies to recognize time spent by women in socially valuable activities such as caregiving. It could further enhance support for informal caregivers by increasing availability, access and affordability of formal childcare and elderly care services, as well as financial protection for temporary periods of unemployment or underemployment. Finally, individual women should take action to rely less on partners or families for financial security, put aside more savings and improve their financial literacy to ensure a financially secure retirement. G. van Dooren, et al. 2019. The Caregiver Penalty in Retirement Savings for Singapore Women. Brink Asia. 8 March. G. Van Dooren and J. Lingjun. 2018. 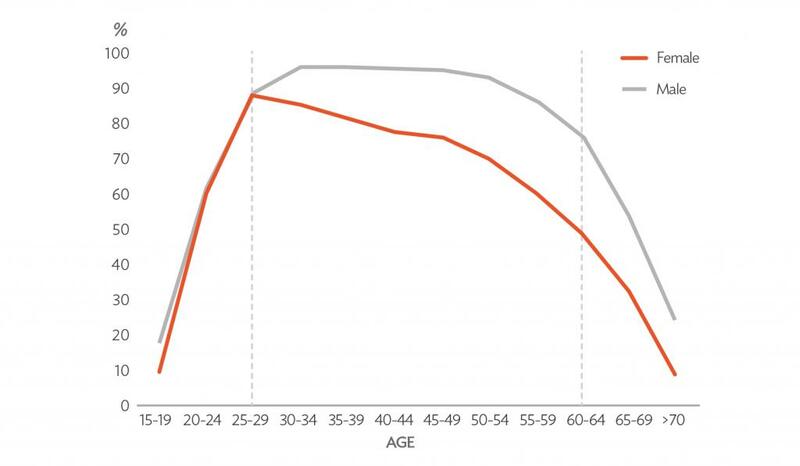 Gender Retirement Savings Gap of Low-Income Professionals. Marsh & McLennan Companies, Inc.
Godelieve van Dooren is a partner at Mercer and leads Mercer’s Career Products in Asia, Pacific and India zones. She also leads diversity and inclusion initiatives for Mercer for the ASEAN countries and supports organizations in implementing diversity and inclusion policies in the region. Kavitha Hariharan is a director at Marsh & McLennan Insights, where she leads research on societal aging and health. Jiang Lingjun is an analyst at Marsh & McLennan Insights, where she specializes in quantitative research and analysis across a broad range of topics and industries. Swati Rastogi is a consultant at Mercer’s Career Products team based in Singapore. She manages Mercer’s workforce metrics and analytics offering for Asia, Middle East, and Africa region.